I’m spoiled. I began running when I was a teenager, and have always taken it for granted as there for me when I need to relieve stress, boost my self-esteem (any day can be a good day if you got a great run in! ), burn calories, get some quiet, get some fresh air, think, etc. I get frustrated at the occasional sexism obstacles I encounter in the MMA world – but after reading Marathon Woman I’m painfully aware of how minuscule these problems are. 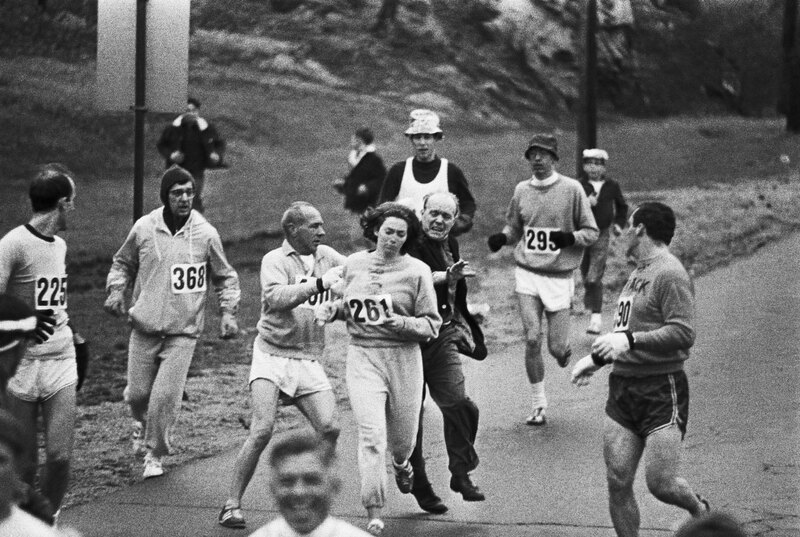 It was shocking, inspiring, empowering, and humiliating to learn that only a few decades ago women were told that distance running would make their uteruses fall out, and that the first woman to officially run the Boston Marathon was assaulted by a race official (in 1967!!). I hadn’t even realized that women didn’t have a marathon event in the Olympics until 1984. About a week ago, P. brought home an autographed copy of Marathon Woman: Running the Race to Revolutionize Women’s Sports that his co-worker had randomly decided to lend to me – incredibly sweet and thoughtful considering I’ve only met her once, and for five seconds at that! The only thing linking us is she knows I’m into running and fitness. This book should be on the reading list of every young woman. While I found the best part to be how a handful of women changed the world for countless women to come, it was also hard to put down because it’s love story – it’s the tale of how Kathrine Switzer fell in love with running, built a career, and found happiness. I found a lot of inspiration in this book – to run, to pursue my passions, to stand up for myself, and to do my part for women everywhere by living up to my potential. It’s horrendous and sad how many women have stood against the progress of women’s rights, and how many still do (because of their religions? jealousy? fear?). Ladies – we need to support each other and keep showing the world what we can do! ← I Ate Nine Hot Dogs and Am Proud of It!